Are you tired of looking in the mirror and seeing an aging face with saggy skin? Facial aging is inevitable, but when the changes that you see start to bother you—think sagging skin, looseness in your neck and a poorly defined jawline—you may want to consider a Facelift. It is the only rejuvenation option that will provide you with long-lasting improvement. The end result will always be a more refreshed and youthful, but very natural version of yourself. Together, we will look at your face and the areas that are affected by the signs of aging to decide which techniques are best for you. A Face Lift is perhaps one of the least understood of all aesthetic surgical procedures. Many people believe that a person needs to be quite mature to have this procedure done, or that the procedure itself results in a tight, expressionless “operated-on” look. In Dr. Lorenc’s opinion, today’s advanced Face Lift options work as well for patients in their 40s as they do for patients in their 70s, and his surgical objective is to subtly improve and refresh, rather than drastically alter, a patient’s overall appearance. Ask about a brow lift, lasers, or injectables if your upper face and forehead are a concern. Elevating the cheeks can give a more voluminous look, but unless there are fat transfers or fillers, there will be no additional volume. Although a Face Lift can dramatically improve and rejuvenate your appearance, it doesn’t stop the aging process. Keep in mind that your face will continue to age with time. If you have any of the following conditions, a Face Lift might be right for you. Also physically healthy men and women who are realistic in their expectations and interested in reducing the appearance of sagging face and neck skin. Patients with a well-defined bone structure and skin that still retains some elasticity often receive the best results. Underlying muscle and facial tissue is tightened and repositioned. Loose, sagging, or excess skin is removed. Incision marks are shorter and hard to notice. Incision marks do not alter the hairline. The option for anesthesia can either be Local anesthesia in combination with sedation which is the more common one during Face Lift surgery, or general anesthesia. Mini-Face Lift: Known as a limited-incision lift, this technique is ideal for younger patients with early signs of aging and sagging. It is less invasive and uses shorter incisions. Mid-Face Lift: Designed to treat just the mid-face area, this type of lift elevates the cheeks to a more youthful position. Full Face Lift: This lift targets other more serious signs of aging such as excess sagging and skin laxity, deep creases and jowling. It also provides the longest-lasting results. A Mini-Face Lift may provide the results you’re looking for with minimal scarring. The Mini-Face Lift is for those who have limited sagginess or excess skin in the mid-face, jawline and neck, and few concerns with a droopy brow. These Face Lifts are less invasive and use short-scar and endoscopic techniques to reposition the underlying facial tissues for a more youthful contour. If you choose to have a Mini-Face Lift in your 40s, the rate at which the lower part of your face ages may decrease. It’s becoming more common for women in their 40s and 50s to have smaller Face Lifts to correct early signs of aging and improve definition. By using smaller incisions placed at the temples and in the hairline (which can be hidden easier), the underlying muscles are tightened, which provides a youthful boost to the face. 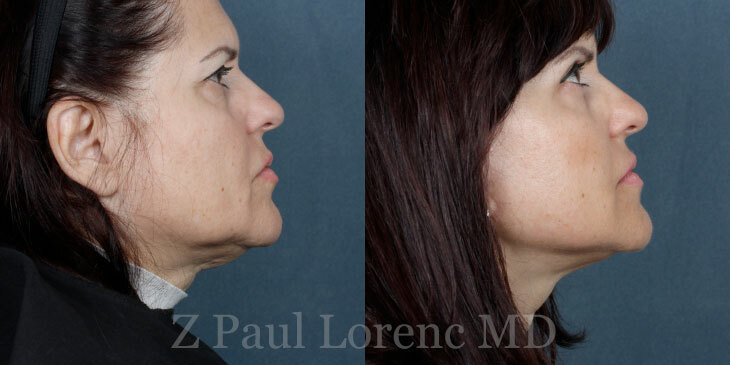 Procedure time for Mini-Face Lift is 60-90 minutes and the recovery time is one to three weeks. The more elastic your skin is, the longer-lasting the results will be—up to eight to 12 years. The midface/cheek area is key in the formula for a more youthful appearance. With age, the fatty tissue that normally drapes over the cheekbones can sag. The result is less prominent cheekbones and a droopy fold of skin and fat between the nose and the cheeks (referred to as the nasolabial folds). By elevating and tightening the underlying structure of the cheeks and removing any extra skin in the area, the midface has a more youthful look to it and better definition. Many doctors elect to use an endoscope (a special tool with cameras that allows your surgeon to view and reach distant anatomies through small incisions) when operating on the midface, to reach deeper or more contained areas. I like to perform this type of lift to target concerns in the middle of the face and cheeks with very small incisions that are about 1 to 2 centimeters in length, which makes for a minimally invasive operation. The traditional Face Lift (technically known as rhytidectomy) is the most comprehensive way to reduce signs of aging from the forehead to the neck, and all areas in between. If you are in your 50s or 60s and opt for a traditional Face Lift, your face will age more slowly. This type of lift allows for fat redistribution, muscle reposition and reduced excess skin in order to provide the most enhanced results of all types of Face Lifts available today. When Dr. Lorenc performs a full Face Lift, he hides the incisions in the contour of the ear, around the earlobe, and/or in the hairline. A small incision under the chin might be necessary if fat needs to be removed and if the muscle in the neck requires additional smoothing. For the most natural look, he uses the SMAS (superficial muscular aponeurotic system) technique, in which he tightens the deeper layers of tissue and the muscle below the skin and remove excess skin, which smooths out deep wrinkles. Better healing*: Most often, having surgery when you’re younger means that you should have an easier recovery. Reduced cost: If you haven’t entered the full-fledged realm of aging, you may not need to tack on additional surgeries. Prevention*: Patients used to wait until their faces started to fall before they would lift it. Doing surgery early may help preserve the structure before it sags. Though most patients only experience mild pain or discomfort, your doctor will prescribe a pain medication to help control any discomfort that you do experience. Get your skin in good shape with regular use of a retinoid and treatments like chemical peels and microdermabrasion. Avoid the sun at all costs. If you are a smoker, stop smoking at least three weeks before and after surgery. Get medical clearance from your primary physician. Your plastic surgeon will order blood work to assess your health and detect anything that may compromise your recovery. Avoid taking anti-inflammatories, aspirin and certain herbs and vitamins, which can increase risk of bleeding. There will be preoperative photographs to document the changes. You’ll need to sign informed consent documents that spell out the procedure you’re having, what to expect, instructions to follow and any possible risks. Eat well and try to avoid anything spicy, rich or greasy. Pack a bag, and be sure to include comfortable, loose-fitting clothing that you don’t need to pull over your head. Bring a hat or scarf to wear on the way home. Will I Have Facelift Scars? The incisions for a Face Lift tend are behind the ears and in the natural creases of the skin. They are often healing as thin thread-like lines that are well camouflaged. What Procedures Can Combine with a Facelift? 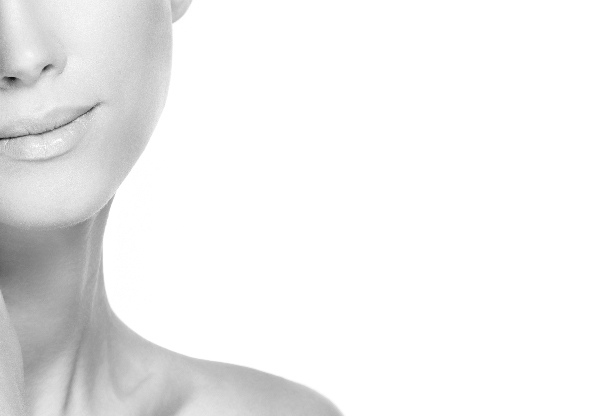 In many cases, a neck lift is performed in conjunction with a Facelift to achieve maximum rejuvenation and a natural-looking, balanced result. Since the face and neck are close to each other, they tend to age at the same rate. It’s rare to see one showing the signs of aging while the other area is free of them. Your surgeon may recommend a combination Face Lift and neck lift procedure for you if your skin is excessively saggy, or you have a loss of muscle tone. Similar to a Face Lift, a neck lift reduces fatty deposits, repositions underlying tissue and gets rid of excess skin for a more youthful look. Your surgeon may customize your procedure so that it tackles your aging. If a Mid-Face Lift is performed along with an endoscopic brow lift, the cheek area can be elevated while raising or lowering the brow, addressing the upper and lower eyelids and treating under-eye bags. Another perk is that the surgeon can perform the two procedures through the same incisions. If you are interested in learning more about a Facelift and would like to see if you are a good candidate, contact us at (212) 472-2900 to schedule a consultation at our office in New York City.